We live in an age-obsessed culture. Everywhere you turn, there are advertisements for wrinkle creams, serums, and a wealth of other anti-aging products. With skincare items geared towards both prevention and correction, one question remains: at what age do wrinkles actually appear? Wrinkles are a natural part of the aging process. However, they typically begin to appear once you reach your mid-twenties to early thirties. This occurs due to changes in the skin. According to a study by Olay, 23andMe, and a group of Harvard researchers, there are noticeable differences in the skin during each decade of life. In your twenties, the skin responds to antioxidants less, making it more susceptible to damage caused by oxidative stressors. If that wasn't enough, your skin also becomes drier. This is due to a levelling out of hormones...though you may still experience pimples and breakouts. Dry skin opens you up to fine lines around the eyes and mouth. 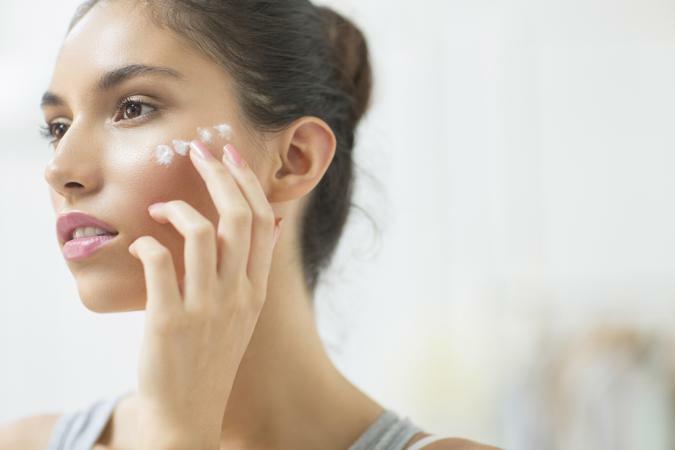 A targeted skin care routine is essential to prevent premature signs of aging. Once you reach your thirties, the creation of collagen slows. This makes the skin appear thinner and less full. Additionally, skin will continue to feel dry, it may become sensitive, and the undereye area will be more delicate. The latter opens you up to more noticeable lines around the eye area. You may also start to notice visible wrinkles on the forehead. Products that are high in vitamin B3 can help combat these wrinkles. By your forties, things change even more. The life cycle of skin cells slows, which can dramatically impact your appearance. Other skin changes include a loss of elastin, adult acne, and increased sensitivity. (These issues are linked to lower levels of estrogen in the body.) You'll notice deeper lines around the eyes, mouth, and forehead, along with age spots. 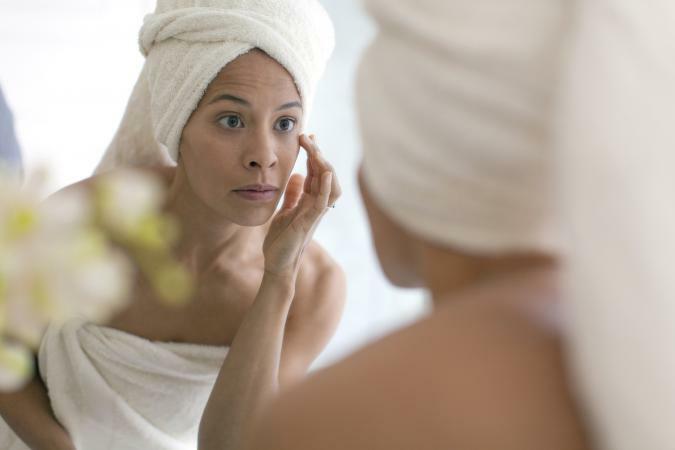 Look for products that contain retinol and peptides to help combat these common signs of aging. In your fifties, sixties, and above, skin will continue to thin and dry, with lines becoming deeper and age spots more visible. According to a study on the effects of estrogens on skin aging, women lose a third of collagen during the first five years of menopause. During this time, hydration is key, as it becomes harder to hold onto moisture. Eye wrinkles tend to be the first sign of aging people notice. In your twenties and thirties, things like crow's feet, tear troughs, and bags underneath the eyes become visible. Combat them by paying attention to skincare sooner rather than later. Forehead wrinkles can also appear early on, thanks to everyday facial expressions and repeated muscle movement. They typically stretch horizontally across the forehead but may be vertical as well, forming between the eyebrows. Lip wrinkles are common once you reach your mid to late thirties. Lines around the mouth develop naturally as you age but can be seen earlier (in your twenties and thirties) if you are a smoker. While it is impossible to avoid wrinkles altogether, there are certain factors that can cause them to appear prematurely. Spending time outdoors is a wonderful thing. Sunshine provides your body with much-needed vitamin D, which helps fight infections, strengthens bones and muscles, and aids in overall health. However, there is such a thing as too much sun exposure. Especially if you fail to protect your skin. It can lead to short-term issues, like sunburns, as well as a long-term issue, like premature aging. According to a report by the World Health Organization, sun can damage the skin, causing premature wrinkles, sagging, and undereye bags. In fact, up to 90% of visible changes attributed to aging can be linked to sun exposure. Another lifestyle choice that can impact your skin is smoking. In addition to the countless side effects, like an increased risk of lung cancer and heart disease, smoking can also affect your appearance. Wrinkles occur earlier for smokers because of the nicotine in cigarettes. The Mayo Clinic website says that nicotine narrows the blood vessels in the outer layers of the skin. Reduced blood flow means the skin gets less oxygen and essential nutrients, causing it to look older than it is. Additionally, the chemicals in cigarettes have been found to reduce collagen and elastin, making you look older faster. Certain chemicals can negatively impact your skin. Unfortunately, this is true of many skincare products and cleaners on the market. They contain chemicals that either speed up or exaggerate the aging process. Not what you want! Ingredients in skin care products that may cause wrinkles include: sulphate (found in body wash, shampoo, cleaning solutions, and cleansers), alcohols (benzyl alcohol and ethanol methanol remove natural oils from the skin and cause premature aging), as well as DEA, MEA, and TEA (ammonia compounds that dry out skin). Always read the ingredient labels beforehand. There are many common factors in premature aging, including weight. It doesn't matter if you are too thin or too heavy; either one can make you appear older. People who are underweight do not have as many natural fats in their faces. This causes sagging skin and prominent wrinkles. Overweight people have an increased risk of chronic health problems, which can make the skin appear older than it really is. Diet plays an integral role in our overall well being. Poor nutrition causes the skin to wrinkle and show signs of age. A WebMD article on aging reveals that foods high in antioxidants (Vitamin C, E, and A) and biotin are essential for youthful skin. For those looking to take preventative measures (or turn back the hands of time), there are popular anti-aging treatments to try. A few examples include: lasers, ultrasound therapy, creams, serums, and lotions. There are even more unconventional methods to consider, like facial massages. Whichever one - or ones - you choose, know that there are options. Wrinkles are rarely welcomed with open arms, but they are an unavoidable part of life. Know which lifestyle factors can speed up their appearance and be proactive about your skincare routine. This will prevent premature aging and keep you looking beautiful at every age.